The words sola Scriptura are from the Latin language. Latin had endured since the Roman Empire and was the official language of Roman Catholicism; it was used not only for theological writing and teaching but also for the Mass. The vast majority of people attended their churches and could not understand what the priest was saying. If you were to attend a church service in a country where you do not know the language, you would experience a sense of what it was like to attend a Catholic Church in Luther’s day. For sola Scriptura to be fully applied by the Reformation, the use of Latin had to be replaced in Protestant churches by the vernacular, the local language. In the case of Saxony-born Martin Luther, the language was a German dialect, thus, Luther translated Scripture into German, wrote a considerable portion of his works in German, and preached sermons in German. As Martin Luther provided the Word of God in German, so also was the Bible translated into English. A key English edition was the Geneva Bible which was published in 1560. French-speaking Geneva may seem a strange place to publish an English Bible, but the city was known among Protestants because it was the home of John Calvin and a safe haven for persecuted refugees. During the reign of Roman Catholic Queen Mary I, “Bloody Mary,” many British Protestants fled for their lives to Geneva. Among the refugees were several that worked on the Geneva Bible, including one with previous experience, Myles Coverdale, who had translated the first English edition of the Bible ever published in 1535. 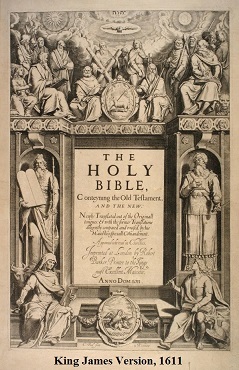 However, the popularity of the Geneva Bible exceeded that of Coverdale’s version because it was printed multiple times between 1560 and 1644, and it became the favored translation among Puritans as well as the official version of the Presbyterian Church in Scotland. The Geneva Bible was the first English Bible printed with numbered verses and its many commentary notes in the margins showed the theological influence of John Calvin. The Bible that is most often identified with English editions is the King James Version which was first published in 1611. It was named for King James I, who hoped his version would supplant the Geneva Bible to become the favored edition. There were no notes in the King James Version other than alternate translations of words and associated necessities, but it did include in its introductory section several genealogy charts, calendars, diagrams, and illustrations. It was a movable type printing press masterpiece. As the years passed, the hope of King James I was fulfilled when his version supplanted the Geneva Bible as the most common English version. With the growth of the British Empire, the English language and the King James Bible were distributed around the globe. When the United States achieved independence from rule by the British monarchy, it continued to use the monarch’s Bible, the King James Version. Sola Scriptura has continued over the years to drive Bible translation, distribution, and reading. The fundamental truth that God unlocks the soul with the key of his Word as the Holy Spirit opens the door of understanding has resulted in considerable effort to distribute vernacular Bibles. Presbyterian and other foreign missionaries have provided translations of the Bible on foreign fields, but considerable distribution has been accomplished by interdenominational organizations such as the British and Foreign Bible Society (founded 1804), American Bible Society (1816), Gideons International (1908), and Wycliffe Bible Translators (1942). Thus, historically Protestant churches, their derivatives, and to some degree generically Evangelical churches and agencies continue to echo Luther’s sola Scriptura as the cornerstone of their ministries.